Actvity Summary: This activity allows students to access online data and generate graphs that illustrate distribution changes in marine microfossils preserved in ocean sediment cores. 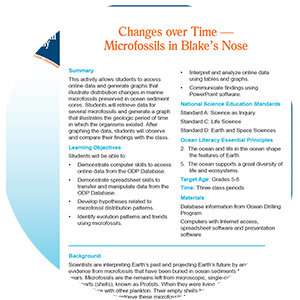 Students will retrieve data for several microfossils and generate a graph that illustrates the geologic period of time in which the organisms existed. After graphing the data, students will observe and compare their findings with the class.